The next morning, it was cloudy out but had stopped to rain already. Irene had a sore throat and did not feel like hiking so we decided to visit the Gornergrat. 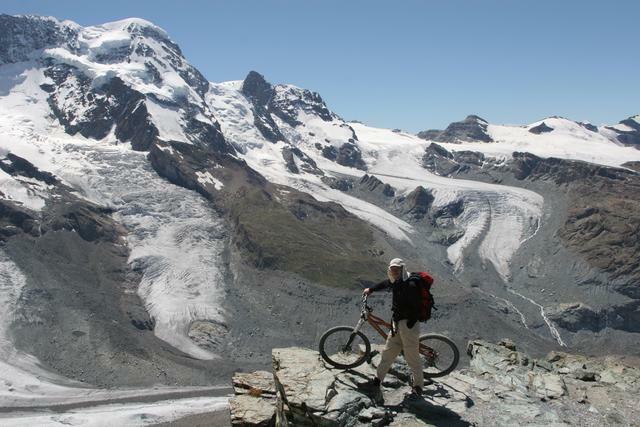 During breakfast we met a couple that was in Zermatt for mountain biking and asked them about possible rides. I went to a close by sports shop, Slalom Sport which rented out decent mountain bikes. I took off at 11:15 and we decided to meet at the Gornergrat station at 13:45. I rode up towards Tufteren and got a nice view of the Zinalrothorn on the way. The road starts out paved and then becomes gravel but is not terribly steep so it was easy going all the way up. From Tufteren I continued on to Sunegga at 2250 meters where the path descends down to the turnoff to Findeln. I continued straight, climbing up past the Mosjesee. A bit after the lake I turned right on a short hiking trail which would get me up to the road from Gant to Riffelalp. I had to push my bike a bit since it was quite steep and had lots of stone ridges to guide water off the path. As soon as I reached the road it was a quick mixed up and downhill to the tracks of the Gornergrat railway between Riffelalp and Riffelberg. The path leading up along the railway looked very steep and consisted of rough, loose gravel. 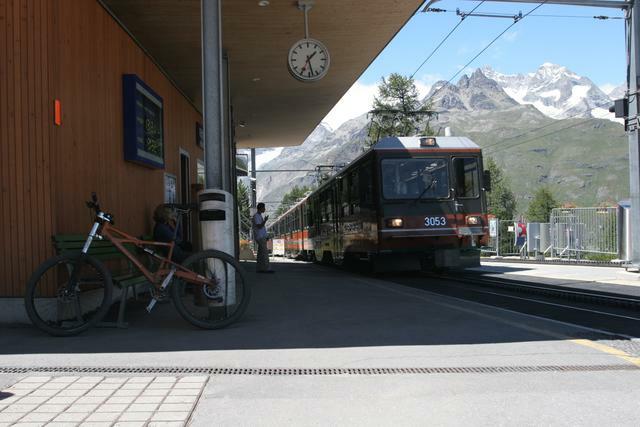 Since it was already 13:10 I biked down to Riffelalp and hopped on the train there to reach the top in time. At the top I met Irene and we enjoyed the view across the Gornerglacier towards Monte Rosa. In this direction one can see the Theodulglacier which apparently just barely makes it down to merge with the Gornerglacier. I think I will come back in 10 years and compare pictures. The Theodulpass which we left early on the day before is visible a little bit to the left of the center of the picture. 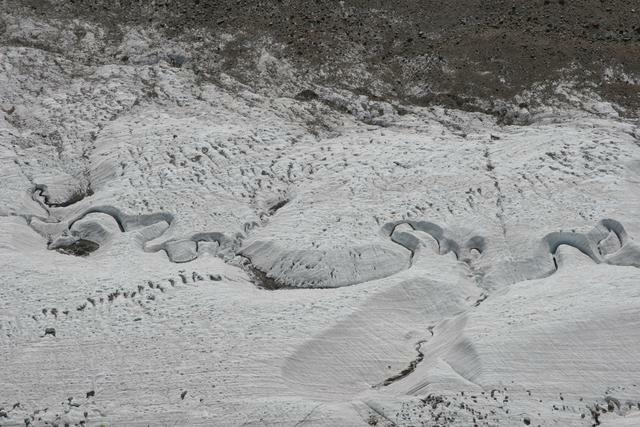 A detail of the Gornerglacier. Melting water forms valleys in the ice. 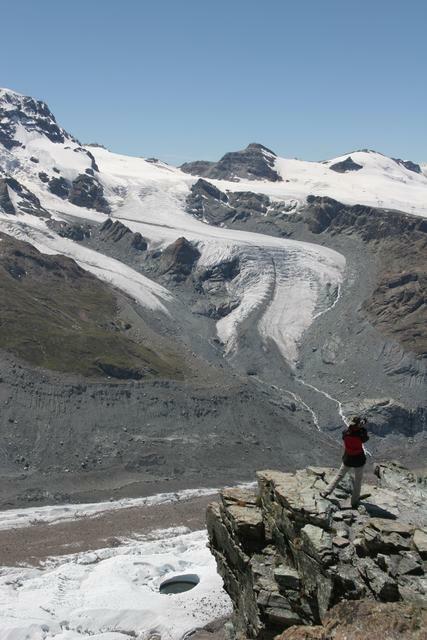 Me in front of the Breithorn, Kleines Matterhorn and the Theodulglacier. After having taken a sufficient amount of pictures we headed into the restaurant for some food. I found it overpriced and the sausage and fries I had did not impress me. 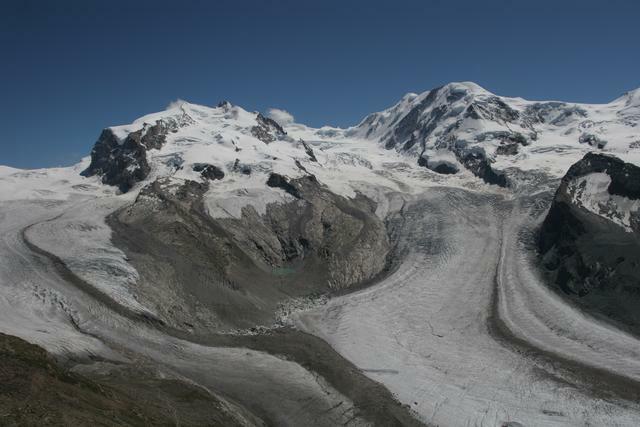 To get a closer look at the glacier we headed down to Rotenboden and followed the trail to the Monte Rosa hut for a bit. 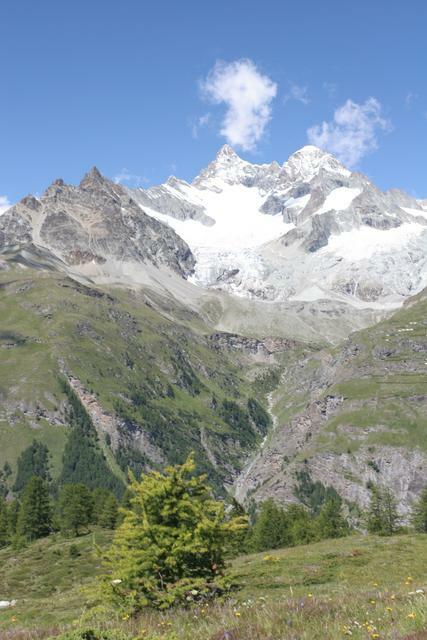 Eventually we turned around, Irene took the train back to Zermatt and I rode down. I was glad I had a mountain bike since the path was often very rocky. Since Irene was feeling better in the evening, we decided to finish the last three days of the Tour Monte Rosa. We decided to reduce our luggage and leave one part at the train station in Zermatt in a locker (this works for up to 72 hours, otherwise one has to deposit it there) and come back for it before we return home. We bought two silk sleeping bag liners for use in the huts on the way and left tent, mats and the heavier sleeping bags as well as a lot of superfluous items in Zermatt. This allowed us to reduce down to just one backpack of about 15 kg instead of two with 11 and 19 kg.